Experience the time-served traditions of an established hardware store with J Deamer and Son. Our popular Stevenage shop provides a full range of home, pet and garden supplies for customers living in the Hertfordshire area. We specialise in a traditional service delivered at a personal level that is rarely matched by today’s modern retail outlets. 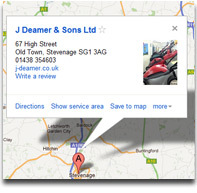 J Deamer and Son specialise in the lawnmower repairs and servicing, and are able to carry out work on all popular makes and models. With more than 75 years of extensive trade experience behind us, we are capable of delivering quality workmanship and exemplary service at highly affordable local rates. Visit our established Stevenage hardware store for a traditional service experience that is unmatched in the local Hertfordshire area. Alternatively, call J Deamer and Son today on (01438) 354603.